﻿﻿Thanks for visiting my web site to learn more about me and my work in the world as a writer, teacher, and spiritual director. 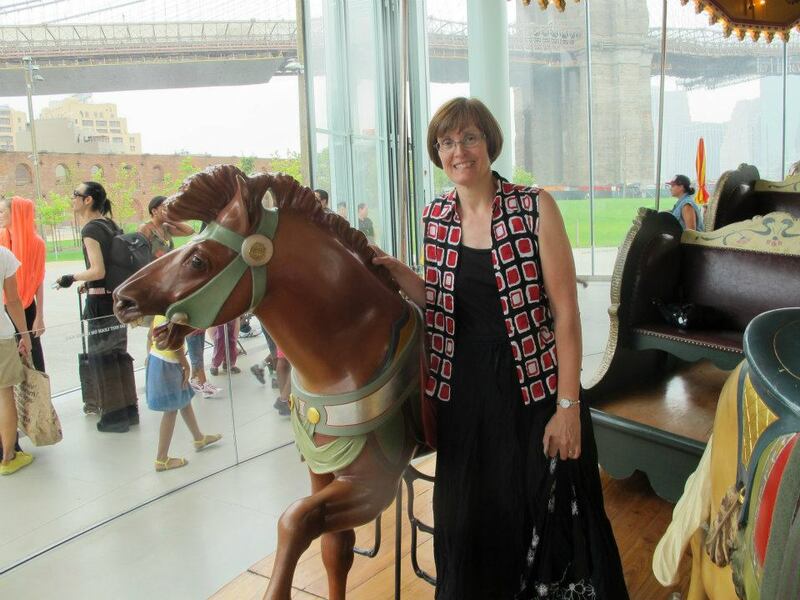 Here I am on the carousel in Brooklyn NY, which is the same one that once lived in Idora Park, Youngstown, Ohio. The horse and I have taken opposite paths; I grew up in New York City and lived in Youngstown for almost 9 years. Both are fascinating places filled with interesting people, and the horse and I enjoy observing them. In fall of 2017 my husband Matt and I moved to Lake Chapala, Mexico, where he serves as part time minister at the UU Fellowship. We also have a home in western North Carolina, where I spend most of my time. Dogs are a source of peace and love in my life, so I delight in sharing photos on my welcome page. the canine holiday that falls a few days after getting Christmas toys. Rosie, a graduate of a prison training program in Ohio, came to us in 2015. Here, she demonstrates how handy a tail can be when a girl wants privacy. She enjoyed Mexico and is now exploring the large yard and the parks near our home in Hendersonville NC.